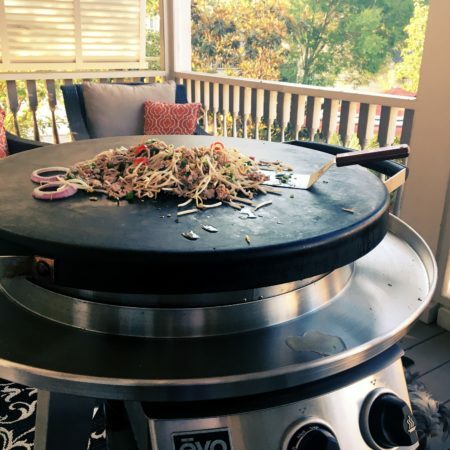 You are going to seriously love this spicy, crunchy, healthy recipe for Thai Warm Salad made on the Evo Grill. It’s fun, easy and delicious. It can be changed up easily to suite your taste, dietary restrictions, or what’s in your refrigerator. I can’t wait to hear what your family and friends say after you make it for them the first time. Suddenly, you are a Thai food genius and expert exotic dinner party hostess. My warm Thai salad is a quick and satisfying option to take away. I know this because I’m not Thai or even a professional chef trained in Thai cooking. I’m just a white girl who often craves Asian food and has a passion for cooking. I love it like in my last meal would be Chinese Dim Sum, Vietnamese Garden Rolls, Crispy Whole Fish, Garlic Crab and Thai Vegetable Stir Fry kinda love ( what’s your last meal menu look like?). It is the type of food I most often make at home and always seek out when traveling. Because although I live in the amazing food center that is Charleston, SC, it sadly lacks a little diversity and options in all things ethnic. I go out for Shrimp and Grits or Handmade Pasta. I stay in for Larb Gai on a Tuesday night. 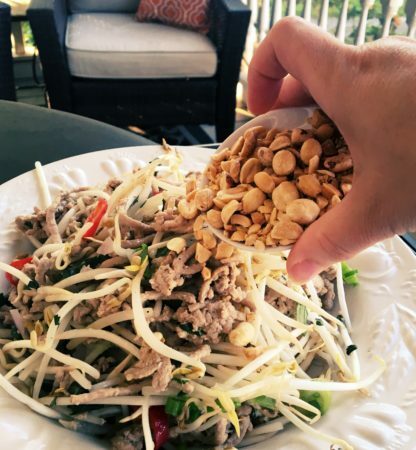 I promise you that this Warm Thai Salad is one of the easiest, healthiest, quickest dishes you can make for yourself or your guests. 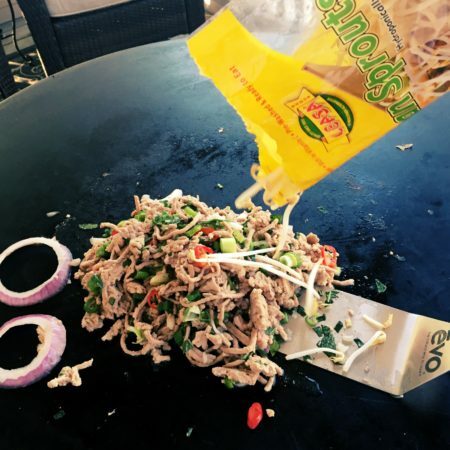 Even if you have never tried making your own Thai take out, this is a great recipe to convince you to start! And if you’ve never had Larb Gai, don’t let the simple ingredient list fool you. This is a major flavor/texture combination which is always a huge hit with everyone who tries it at my house (even kids if you pick out the chilies). People love to eat with their hands. It’s like Thai Taco Night! 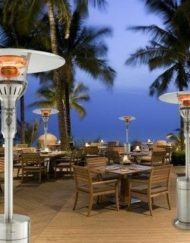 All Thai food is well known for its sublime balancing of salty, sour, sweet, spicy. This satisfying warm chicken salad shows off that famous balance incredibly well. Add to that the fact that’s its low fat, low calorie, nutrition dense, gluten free, and easily made vegetarian. You have a truly winning dish to add to your summer rotation! 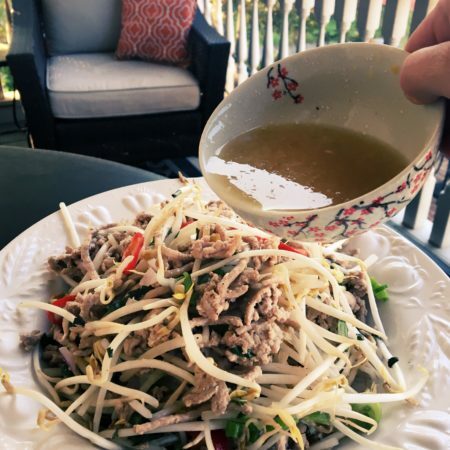 I give you- my version of Larb Gai or Thai Warm Salad with a Twist. Everyone loves to eat with their hands! 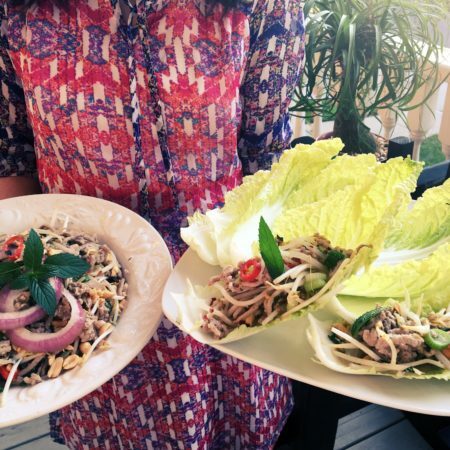 Serve the warm chicken salad with crispy napa cabbage leaves – like a Thai Taco. I’ve fooled around with the traditional recipe for Larb Gai just a little here. 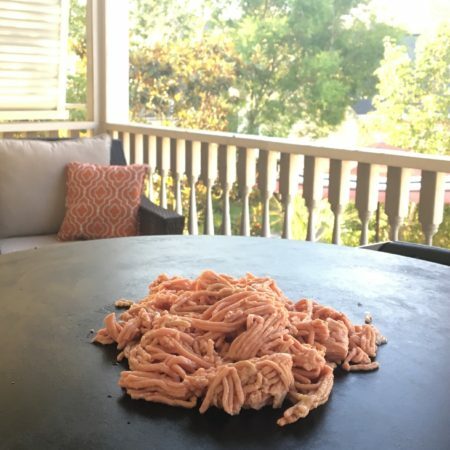 Traditionally a Thai cook would use ground Pork, I used ground chicken here. But ground beef, duck, turkey or diced mushrooms all make great versions of this dish. I have served the finished salad with super crispy Napa cabbage leaves. Although I have seen this in a couple restaurants, it is most traditionally served with seamed jasmine rice or lettuce leaves and cucumbers. I think the Napa leaves are an improvement over both these options. I also add in an entire bag of bean sprouts to my salad. This lightens it up, makes it more of a “salad” as we think of it, and gives an incredible crunch to the dish. The original is very “meaty” but delicious (perfect for Aitken fans maybe?). I also eliminated the toasted rice powder from my version. 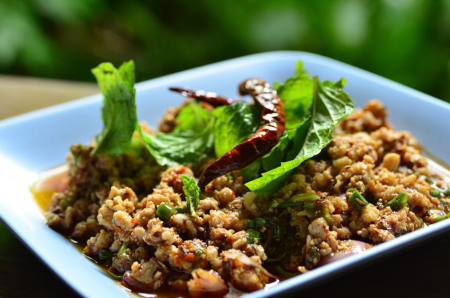 It does usual give a nutty flavor to the traditional Larb Gai as well as acting a binder for the dressing. I just prefer the clean freshness of the dressing without the toasted rice. Do feel free to try it both ways and decide for yourself. 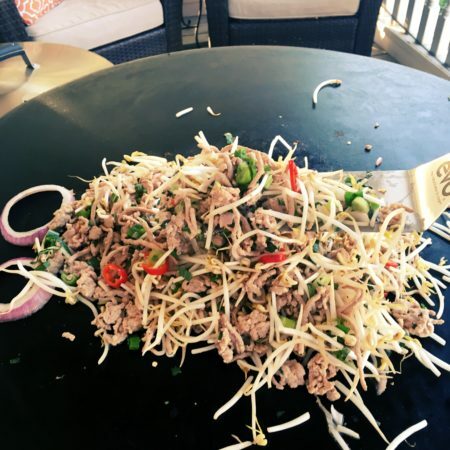 Here is a great recipe for a great traditional Pork Larb from the delightful Village Pantry blog if you want to try the recipe both ways. I also give a link to the toasted rice recipe from She Simmers Thai Cooking site (or you can buy it at an Asian grocery store although it loses flavor fast). Add 1 T at same time as herbs if using. This is the traditional Pork Larb from Village Pantry site. No bean sprouts in sight. Click link for recipe. I love making this recipe on my Evo Grill. Its flat top is just perfect for stir fries of all varieties. And with the dual heat control, I’m able to cook in the center then serve from the just warm outer edge. No pots and pans is another reason I love this dish!But you can easily make this indoors in a regular cast iron or non stick pan on medium heat. 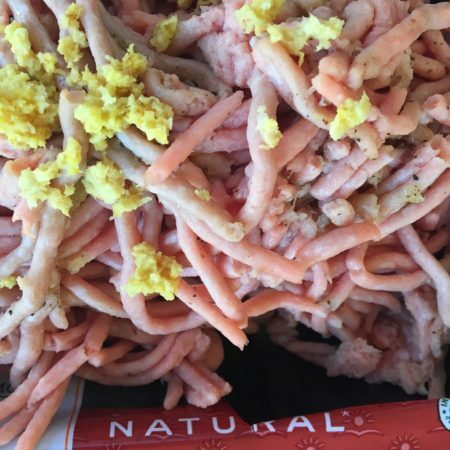 Do a quick marinade of the meat you are using by adding juice of 1/2 lime , garlic, ginger, and salt and pepper to meat before cooking. I do a 5 minute marinade on meat before stir frying. A small amount of water substitutes for oil in this recipe, don’t be tempted to skip this step. Sauté the ground chicken on medium to medium low on the Evo to prevent browning. Medium on stop top in pan. My addition of bean sprouts is what sets this dish apart from other versions. I use the side of my EVO spatula to break up meat as it cooks. Put a 1/4 c or so of water into your pan or onto your EVO grill. (This will help prevent browning by adding steam to your stir fry) Set heat to medium and sauté until meat just changes color. Add in herbs, green onion, scallions, and chili. Sauté another 2 minutes. Turn off heat and add peanuts (if using) and bean sprouts. You want a warm salad, not a soft stir fry so be sure and do this as the final step. Toss to mix and then place in serving bowl. Serve alongside cold crispy napa cabbage leaves ( or substitute romaine if that’s what you have) and extra mint and chilies. 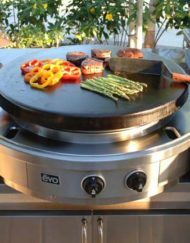 The Evo is perfect for stir frying. 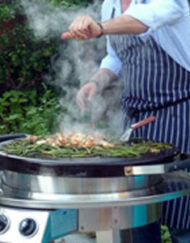 Here I only heated the center ring so that I could serve from the outer ring. So simple. After removing from heat, dress salad with lime juice and fish sauce dressing. This can be altered to your personal taste. Once cooked, I add chopped and whole peanuts as garnish off the heat. Fried shallots make a good substitute for nut allergies. In small bowl mix together lime juice, sugar, and fish sauce. Pour over chicken mixture and toss to dress well. It will be more dressing than used in an American salad, but is with out oil so it doesn’t feel overwhelming. Do not be tempted to add additional oil to dressing or to pan. It truly doesn’t benefit this dish at all. 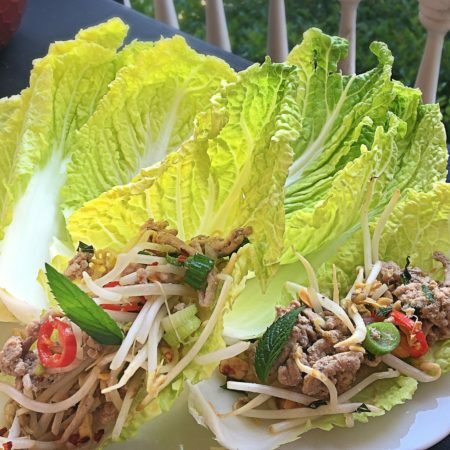 Serve while warm or at room temperature with cool crisp napa cabbage leaves and whole mint leaves (like you would lettuce wraps). I let guests make their own , but with sturdy cabbage you can make in advance without wilting if desired. Additional dried chili powder or flakes can also be offered for those that love it super spicy. My daughter just picks around the large chilies I put in- one reason I use red not green chilies – visibility! Cool, spicy, crunchy and sweet. 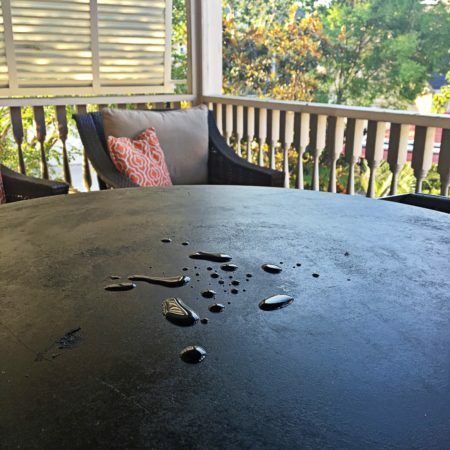 We love this dish for summer entertaining! Suddenly you are a Thai Food Genius. Happy Unofficial start to Summer! I’d love to hear how your Thai Warm Salad with Chicken came out and any questions you may have. Or maybe just your last meal menu!